Jerome Kern (1885-1945) composed his first complete show, THE RED PETTICOAT, in 1912. Between 1915 and 1919, he composed a series of intimate chamber musicals, mostly in collaboration with Guy Bolton and P.G. Wodehouse, known as the Princess Theatre shows. These works — VERY GOOD EDDIE; OH, BOY! ; OH, LADY! LADY!! ; LEAVE IT TO JANE; and ZIP GOES A MILLION — are credited with laying the foundation of the modern American musical comedy. Throughout the 1920s Kern's composing style broadened with works such as SALLY; SITTING PRETTY; DEAR SIR; SUNNY; and THE CITY CHAP, culminating in 1927 with the American operetta masterpiece, SHOW BOAT (written with Oscar Hammerstein II.) With that epic, Kern began a series of works for the stage which were more operatic and involved the close interweaving of music, song and speech, including SWEET ADELINE (1929), THE CAT AND THE FIDDLE (1931), MUSIC IN THE AIR (1932) and ROBERTA (1933). In the 1930s, Kern moved to Hollywood and wrote a series of successful film scores, including SWING TIME, COVER GIRL, YOU WERE NEVER LOVELIER and CAN'T HELP SINGING. His final stage musical, again with Hammerstein, was VERY WARM FOR MAY (1939) and included his masterpiece, "All the Things You Are." Among his extraordinary list of songs are: "They Didn't Believe Me," "Look For The Silver Lining," "Why Was I Born?," "Don't Ever Leave Me," "Smoke Gets In Your Eyes," "Yesterdays," "The Song Is You," "I've Told Ev'ry Little Star," "The Way You Look Tonight" (Academy Award, Best Song 1936), "The Last Time I Saw Paris" (Academy Award, Best Song 1940), "A Fine Romance," and "Long Ago And Far Away." Kern died in New York City in 1945, while preparing to begin work with Dorothy Fields on a new musical entitled ANNIE OAKLEY. Whats Become Of The Night? Wheres The Mate For Me? In 1927, SHOW BOAT came to Broadway at the Ziegfeld Theater, staged by Oscar Hammerstein II. The show ran for 572 performances. In 1926, writer Edna Ferber signed a contract giving Oscar Hammerstein II and Jerome Kern "dramatico-musical rights"" to her novel SHOW BOAT." 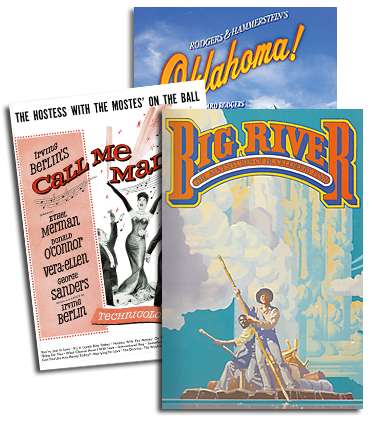 In 1932, MUSIC IN THE AIR opened at the Alvin Theatre on Broadway. It ran for 342 performances. In 1994, the Hal Prince-directed revival of SHOW BOAT premiered at the Gershwin Theatre on Broadway. The revival ran for 947 performances, making it the most successful production of the show to date. In 1995 the show won five Tony Awards, including Best Direction and Best Revival of a Musical. In 1933, MUSIC IN THE AIR closed after 342 performances on Broadway. In 1929 the original production of SHOW BOAT closed at the Ziegfeld Theater after 572 performances. In 1942, Oscar Hammerstein II and Jerome Kern won the Oscar for Best Song at the 14th Annual Academy Awards. They received this prize for "The Last Time I Saw Paris,"" featured in the film LADY BE GOOD." In 1885 was the birthday of legendary composer Jerome Kern, writer of SHOW BOAT in collaboration with Oscar Hammerstein II.